When the Olmec rulers began to lose control of their country about 600 BC, new leaders came forward and took over ruling in Central America (modern Guatemala). These were the Maya. Archaeologists divide Maya history into four time periods, the Pre-Classic, the Classic, and the Post-Classic. The Pre-Classic period begins about 700 BC, about the height of the Assyrian Empire in West Asia, or the Etruscans in Italy. At this time, the Maya were beginning to build stone temples like the ones the Olmec had built before them. The Classic Maya period began about 250 BC. 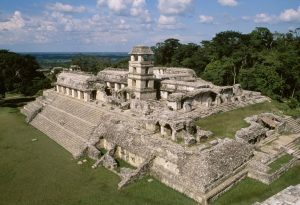 During the Classic period, the Maya (MY-ah) built many cities with stone buildings and many more stone temples. People carved inscriptions on these temples, saying who had built them and in what year. This is the first evidence of writing from North or South America, so it may be the Maya who invented writing in this area. Thanks to this writing, we know that some Maya rulers, like Yohl Ikʻnal about 600 AD, were women. 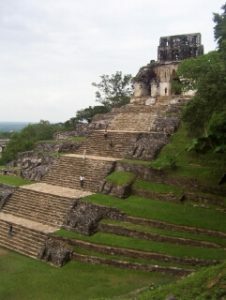 Around 900 AD, though, the Maya people abandoned many of these cities and temples, and kept on with their traditions mainly in the northern part of their country, the northern Yucatan. This would be about the time of the Abbasid Empire in West Asia. This decline may have been caused by climate change related to the Medieval Warm Period, which made the southern part of their land too dry. In this Post-Classic period, after about 900 AD, people mostly stopped carving inscriptions. They kept on building some temples and other stone buildings, but they don’t seem to have been doing as well as they were in the Classic period. In the Post-Classic period, the Maya were more open to learning from their neighbors, especially the Aztec people to their north, in Mexico. In the end, however, the arrival of Spanish invaders in 1519 AD brought smallpox and measles to the Maya, and most people died of these diseases. The few who survived could not defend their country against the Spanish invaders, and so the new ruler of Spain, Charles V, the Holy Roman Emperor, took over ruling Central America too. Cite this page: Carr, K.E. Who were the Maya? Central American history. Quatr.us Study Guides, September 9, 2017. Web. April 26, 2019.